Darius Rucker - "Southern Style"
Tent meetings have been a feature of Ulster evangelical life for centuries. Methodist missionary Matthew Lanktree's diary of 1818 records that at the bottom of our lane here at Ballyfrench, men would rig up a tent out of ships' sails and hold large Sunday services and communion meetings there. Later in the 1800s in the Cullybackey area there were large tent meetings called the Fenaghy Camp Meetings, the first of which were held in mid August 1887. Thousands gathered at these meetings for many years - a reported 12,000 in 1889. Special trains from Belfast were laid on to bring people to the 10-tent site, five of which were for refreshments throughout the days of meetings. The organisers started well, by aiming to bring the most well-known preachers to rural Antrim. D. L. Moody was due to attend in 1892 but was prevented from doing so due to his son falling seriously ill. I wish I could come to you. But the request almost amuses me. Do you really think that I am waiting about for work, or hanging on a nail to be taken down at a few days notice? Why my dear Sir, I never have a leisure day. When the year begins, it is usual to have every day allotted down to its close, and all arranged to be used if the Lord will. Engagements for the week you seek have been made so long ago that I cannot tell you when, and the year 1888 is already in great part allotted unless I go to heaven. It is always impossible for me to leave hom at short notice; and indeed the work of the Lord at home will not often allow for my absence at all. In the end, a Scotsman of County Antrim parentage, Rev John McNeill - known in his day as 'the Scotch Spurgeon', preached that first year instead of Spurgeon, and again in 1892 as a stand-in for Moody. In 1858 Spurgeon had drawn large crowds to Botanic Gardens in Belfast, with trains bringing people from as far as Dungannon and Monaghan to hear him preach. In 1871, Presbyterian Sebastian C Adams produced an astonishing work of art. Entitled A Chronological Chart of Ancient and Modern Biblical History, it was a 20 foot long panorama of world history, exquisitely drawn by Adams himself, and reproduced for sale using the cutting-edge chromolithography printing technology of the time. Further editions would be published during Adams' life, and have been reprinted even recently. The chart starts with the Biblical Adam of Genesis (dated at 4004BC) and ends at 1878, with predictions as to what would happen up to 1900. Adams was born into a Presbyterian family in Sandusky, Ohio, in 1825, the son of Captain Sebastian Adams (1789–1847) and his wife Eunice. They were from Vermont, and Captain Adams was a ship owner who "sailed on the lakes, meeting with many adventures and engaged in the War of 1812. He was a man of great nerve and courage". Captain Adams' father was Aaron Adams, who served in the 1776 Revolutionary War with the "Green Mountain Boys", a regiment based in Vermont. Sebastian junior was the youngest son in the family and travelled across the United States in his early years, almost dying at one stage. Reaching Salem, Oregon, on the west coast in 1850, he met up with his brother William who had already been there for two years, and another brother Oliver. Here Sebastian Adams also met his future wife, Martha McBride, the daughter of Tennessee-born Dr James McBride, who had been a missionary in Hawaii. The McBrides said they were cousins of President Andrew Jackson (see here) so therefore were of Ulster extraction. The chart is one of the most amazing visual artefacts I've ever seen. I am pretty sure a copy of it was once on display at the library of the Ulster-American Folk Park and may still be there. • information on Dr James McBride is available here. Old Comber Whiskey - a determination to shun all brands in the future except "Auld Cummer"
This article from the Belfast News Letter in 1893 corroborates an old advert I saw many years ago, but which sadly I didn't acquire at the time. The County Down town of Comber, very much an Ulster-Scots town, was renowned for producing "Old Comber" Whiskey. Production began in 1825 and it was colloquially known as "Auld Cummer". This article describes a swish social occasion at the long-demolished Mount Alexander, a grand home built by the Montgomeries in the 1620s. Found this on a recent hoke, on a bric-a-brac stall at the Annual County Down Traction Engine Club Rally at Rosemount, Greyabbey, for the princely sum of £4. Made by J.A. Campbell & Son, 64 Royal Avenue, Belfast. Not totally sure of date but from graphical style I would guess early 1950s? After a long long wait we now have our restored gates and rustic pillars installed and a layer of stone over the yard. The gates are about 100 years old and have been repaired, primed and painted in Massey Ferguson red. It has taken us a long while to find the right materials, and men with traditional skills who understood what we were trying to achieve, to make this all happen – and to keep within present-day planning and building control regulations. Field entrances are now wider than the old original gates to let heavy machinery in and out – but they are still an ideal width for a regular family car. It is possible to do a newbuild in a way that honours tradition. There is an Ulster vernacular and I hope other people will also adopt it, in ways which are relevant for modern life, and not limit it to open-air museums – these are places which I greatly enjoy visiting but which can be in their own way a little bit commodified. Ulster vernacular should live and grow in our landscapes. With many thanks to my friend the architect Doug Elliott who steered us through the early years and brought to bear his own life-long awareness of an Ulster aesthetic. Click the images to enlarge. 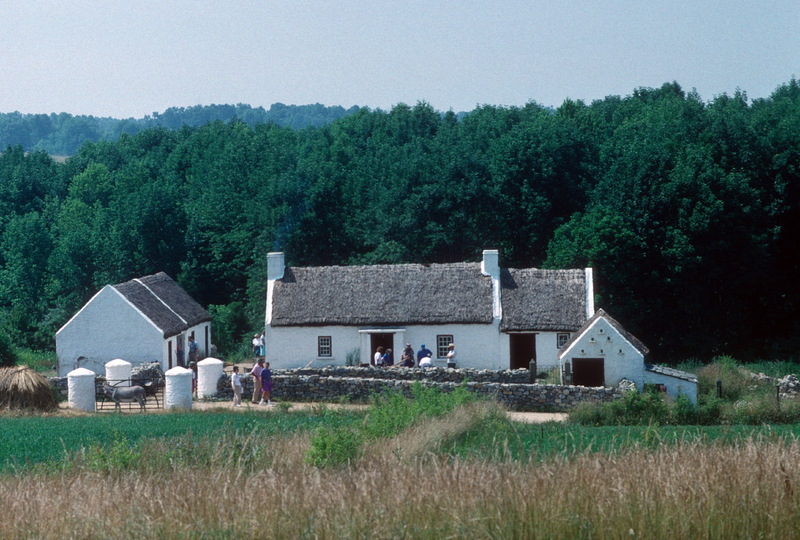 And all heavily influenced by places like this - the Scotch-Irish Farm and Ulster Forge at the Museum of American Frontier Culture, Virginia, which we visited on honeymoon in 1997. (Interestingly it seems to now be just named the 'Irish Farm'). Fisk University in Nashville Tennessee was established in 1865 as a result of the earlier influences and pioneering educational work of County Down man Joseph G McKee of Loughaghery (south of Anahilt), among the 'freedmen' - former Black slaves. He emigrated as a teenager and studied at Westminster College in Philadelphia, became an itinerant Presbyterian preacher in Nebraska & Kansas before coming to Nashville in 1863. In Nashville he set up various schools for Black people, which eventually developed into Fisk University. Some years later, Fisk fell upon hard times and needed innovative methods of fundraising to keep its doors open. The Fisk Jubilee Singers were 'born'. A group of 11 black students formed the Jubilee choir which toured the US and Europe, including Charles Spurgeon's Metropolitan Tabernacle in London, and later to Belfast (at the Ulster Hall) and Londonderry (at First Derry Presbyterian Church) as a short hop after their Scottish dates. And of course they visited Portrush and the Giants Causeway, to collect specimens for the University collection. The coverage of the time, and the warmth and enthusiasm with which they were received, was exemplary. McKee, in poor health, returned to Anahilt to spend the summer and autumn of 1865 with his parents. As you'll see below in the letter written by his uncle, Joseph G McKee died on 25 September 1868 "burned out" by his efforts, at the home of his father in law, Rev. James Arbuthnot, of Harshville, Adams County, Ohio, five years before his young Jubilee Singer protegés visited Ulster. It is a shame we know so little of him here today. • The Singing Campaign for Ten Thousand Pounds can be read online here. • A PhD dissertation on the subject, and McKee, by Crystal A. deGregory is online here. • The portrait of McKee above is from Free at Last by Jane Collins (1896), online here. Postscript - Joseph McKee was interested in his own ancestry, and in his visit home he inspired his relatives at Annahilt to compile a family tree. This was eventually published, in great detail, as A History of the Descendants of David McKee of Anahilt, by Prof James Y McKee in Philadelphia in 1892. It can be read online here, including a dramatic account of how Joseph was almost lost at sea in an Eagle Wing-esque storm.